When Sophie gets angry, she kicks and screams and roars, and then she runs into the nearby woods. On her own in the serene environment, she soon calms down and eventually returns to her family, where "everything's back together again." Bang has perfectly captured a child's fit of anger--that NO fair, I'm-going-to-explode anger. In fact, Bang brilliantly captures the intensity of Sophie's range of emotions through her varying use of hot (angry) and cool (calm) colors as well as her thick brushstrokes full of movement. Truthfully, the message to run away when you are angry is a bit concerning, and probably needs a bit of discussion afterward. But aside from that, this book exudes emotion and is a very useful lead in to discussions on how to deal with anger. Below are sample pages. Bang brilliantly captures the child's emotions via color choice and strong brushstrokes. 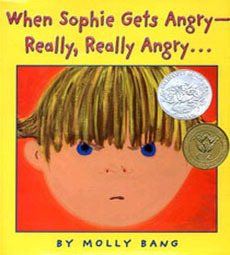 The intensity of Sophie's angry feelings is shown in strong brush strokes and bright red, orange, and purple, as in the pages below. 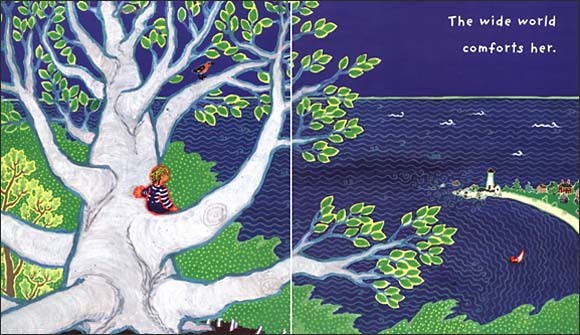 You may also want to check out other books by Molly Bang, such as those shown below. To learn more, click on the book covers below or the link above.